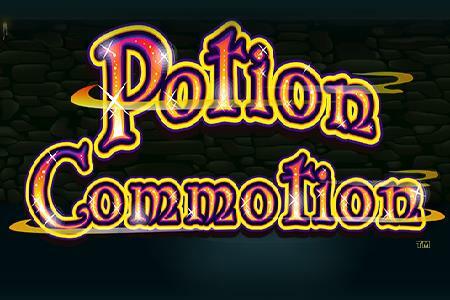 NextGen Gaming’s latest slot, Potion Commotion, is a 5 reel, 20 payline game set in a laboratory and filled with mysterious liquids. NextGen Gaming has released Potion Commotion, a slot sure to cause excitement with its free spins, multipliers and payouts. The symbols on the reels are a variety of different shaped bottles with different coloured liquids inside them. There is also a wild bottle of potion and the Potion Commotion logo is the scatter symbol. The coin size ranges from 0.01 up to 2.00 and it is possible to play with up to 20 coins per spin so the maximum bet is 40 coins. Players will receive a payout for landing just one wild symbol anywhere on an active payline while spinning five of them wins 5,000 coins. The second most valuable symbol is a pink potion with a heart in it which pays out up to 1,500 coins. Spinning 3, 4 or 5 of the scatter symbol will award 10, 15 or 20 free spins respectively. All winnings during free spins are subject to a 3x multiplier while free spins can be retriggered indefinitely. The game also has a gamble feature which gives players the chance to double or quadruple their winnings. After each winning spin players can click on the gamble button, they then need to predict the colour and suit of the next card drawn from a pack. Guessing the correct colour will double winnings while the correct suit will quadruple winnings.